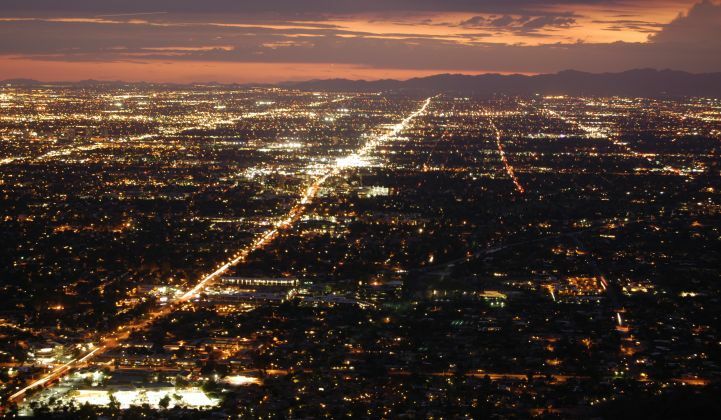 Arizona’s largest electric utility will spend up to $4 million on a residential energy storage program following a pioneering decision by the Arizona Corporation Commission last month. The utility, Arizona Public Service, has 120 days to decide how to spend that money and get approval from the commission, so it’s not clear yet what form the deployments will take. This decision, though, appears to mark the first time a state other than California has specifically mandated investment in storage for the home. It stakes out a new way for state utility commissions to experiment with energy storage technology in a limited way, opening the door for expanding the nascent industry down the road. The commission achieved this at no additional cost to ratepayers by tapping a surplus in a fund already collected for energy-efficiency projects, said Commissioner Andy Tobin, who proposed the idea in June and, with the help of Commissioner Bob Stump, refined it into the version passed at the July meeting. Residential storage can do a lot of things that are valuable to the grid, such as storing rooftop solar generation for self-consumption, lowering a house’s load during peak demand periods and providing energy the utility can call upon when needed. The challenge is that with so many functionalities, utilities have a lot of options to sift through in designing optimal programs for making use of storage. It’s better to think through these things before residential storage becomes a widespread phenomenon. The new allotment, then, comes at an appropriate time, as the costs of storage for household use still outweigh the available returns in most cases, given the ways markets are structured currently. “Distributed generation technology may require sending more complex price signals not otherwise appropriate for traditional customers,” the proposal says. The economic case for storage is stronger when the cost of power reflects the costs of production -- for instance, when a customer pays much more for electricity at peak times compared to off-peak. Batteries then save the owner money by loading up when electricity is cheap and discharging when it’s expensive, so the household doesn’t need to buy expensive peak power. Most customers are insulated from these price changes, but this pilot program would change that for the households that participate so they can earn rewards for adopting storage. Arizona grapples with particularly brutal demand peaks due to high air-conditioning use during its hottest months. Those peaks force the utility to build out generation that isn’t needed most of the year, and that usually comes in the form of expensive gas peaker plants. One of the few options, though, is incentivizing families to turn to stored energy at those times. If the pilot helps create a market for storage in the state, it could lead to profound savings for ratepayers in the long run. “If you can take two hours in storage out of a four-hour peak in an Arizona summer, that’s huge,” Tobin said. The commission also passed a measure in July to target energy-efficiency programs more specifically at reductions during periods of peak load. Energy-efficiency programs attempt to reduce electricity consumption overall, but actions that reduce general load don’t necessarily help tackle peak demand. “We should definitely not neglect baseload types of energy-efficiency measures, but since energy prices are so low, we should have a recalibration and tackle what’s going to be the main cost driver for ratepayers, and that’s flexible peak capacity,” Huber said.